UPDATE: Uber contacted me in response to this post and told me that the advertisement it describes had been taken down. This response was very encouraging. This post remains as part of the record, but if you read it, please also read my follow-up, here. Can we stop pretending that Uber doesn’t want to destroy our high-capacity transit systems? Because this ad really clears up any doubt, doesn’t it? destroying one of the last few places in the city where a millionaire might sit next to the guy who washes dishes in her favorite restaurant, thus achieving an even more perfect state of rigid class segregation. In this world, a majority who can’t afford Uber has no good transport options and is therefore pushed further away from the sources of opportunity that they could use to improve their lives. I apologize if I sound like a killjoy, but the logic here is as firm as the logic behind climate change. When corporations state their intentions this clearly — especially if those intentions line up with universal corporate goals of growth and profitability — we should believe them. We should believe that Uber, given the chance, really would lead us into the dystopia of gridlock and class segregation that this ad implies. And when it comes time for transit agencies to make deals with these organizations, they should know who they’re dealing with. And yes, when I really need ridesharing (only after checking the transit options first), I prefer Lyft for now, a company that actually seems to respect public transit and wants to complement it rather than destroy it. And I look for the local companies that are doing the same things. Because every purchase you make is a statement about what kind of world you want, regardless of whether you mean that consciously. 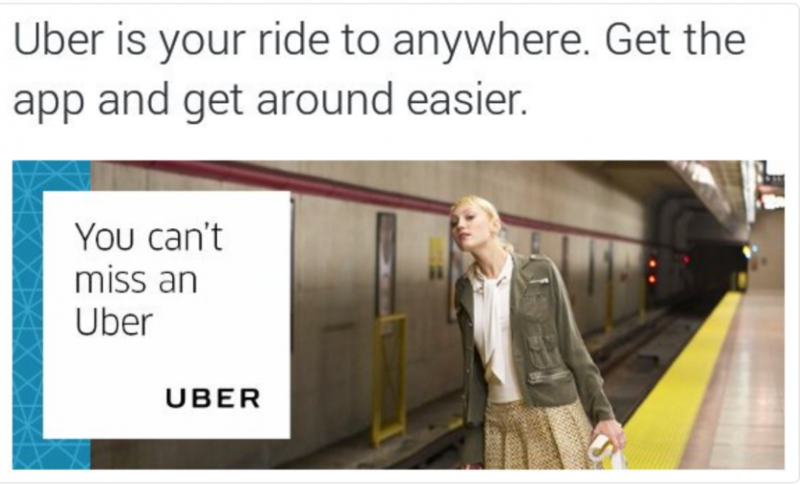 A response from Uber would be welcome, but really, this ad says what it says, doesn’t it? Great post. A world in which everyone takes an Uber instead of the subway or a bus is a world worse than we have now: more people in cars in front of you slowing you down on your journey to your destination, all while depriving public transit of ridership that helps sustain it for the majority of people not in Uber’s socioeconomic reach. Cars are cars, whether they’re being driven by me, a stranger, or a robot. Nobody can fully predict the self-driving cars effects at this time. We all have theories. If Uber leads to “more people in cars in front of you slowing you down”, then mass transit will continue to have an advantage, and it will survive. If Uber continues to be more expensive than transit, then mass transit will continue to have an advantage, and it will survive. If neither of these things happen, then transit will die, and no amount of praying will bring it back. If subway service is really so awful that Uber is a better option, can you blame people for choosing it if they can afford it? Wanting people to have less transportation choice so they are forced to take a worse option seems especially cruel. Very few people can afford to use Uber for all trips. Transit riders and Uber riders are made up of the same minority of Americans who don’t have cars or don’t just drive their own car for every trip. Uber makes it easier for people to give up individual car ownership. It makes it easier for people to live their lives with a backup plan if they, for instance, are stuck with a train that’s not arriving and need to be somewhere. Why criticize a service that expands the audience for transit? The vast majority of Americans don’t take transit, so I think it’s more helpful to see Uber (Lyft, etc) as expanding the pool of potential transit riders than to see it as peeling off the wealthiest (and/or most time-sensitive?). The idea that we will see “useful transit systems die from elite apathy once the elites are all on Uber” is hilarious. That already happened 50 years ago when the elite gave up on transit and drove everywhere and we remodeled our cities to make driving our own cars the only sensible way to get around for the middle classes. Even in comparatively transit-rich New York, Bloomberg made headlines for occasionally riding the subway to work, and the current mayor doesn’t even do that. In a world where personal car ownership is king, I can’t see any fault in making it easier for people to do without, which Uber unquestionably does. Lots of wealthy people, and of all people living in Manhattan, walk to work. Check out that mode share. Highest in NYC. I think this is all a bit over-dramatic. If Uber was really a threat, we should have expected Taxis or bicycles to have killed off public transport a long time ago. The fact is, public transport in low-density areas is often terrible. Missing the bus or train on a service that might only be hourly IS a disaster. Uber is just another tool in the tool kit. It has a role, just like buses, bicycles, walking etc have their roles also. A knife wielded by a robber can kill, but the same knife wielded by a surgeon can save. It is all in how it is used. I suspect what you’re seeing here is a disconnect between different parts of Uber (i.e. marketing vs. actual policy). Most of the policy people I met during my brief tenure at Uber seemed clear on the idea that the biggest market opportunities were with displacing SOV travel, not transit. It’s certainly possible that people have different views on this now, but I suspect this was just unfortunate marketing. My guess / hope is that Uber is still looking for win-win arrangements with transit. You are right, I think, that Lyft has been more consistent / entrepreneurial in seeking cooperative agreements with transit agencies. Some of that success is likely due to Lyft’s otherwise happier reputation. But, some of it certainly speaks to the disposition of the company and to the general awesomeness of Emily Castor and her group. Finally, I know for a fact that you have fans at Uber (no doubt Lyft too). You might find that your thoughts on what it means to complement transit find their way into reality! I would disagree that Lyft seeks to complement transit rather than destroy it. Earlier this year, Lyft start putting ads on Muni bus stops in San Francisco with images and statements such as shown on the following website: http://sfcitizen.com/blog/2015/11/05/so-lyft-is-paying-our-sfmta-to-put-up-bus-stop-ads-that-make-lyft-look-like-a-transit-system-stops-that-just-wont-stop/. The image only displays the Muni Metro system and ignores the vast bus network that is intended to get a person everywhere in the City with only one transfer. 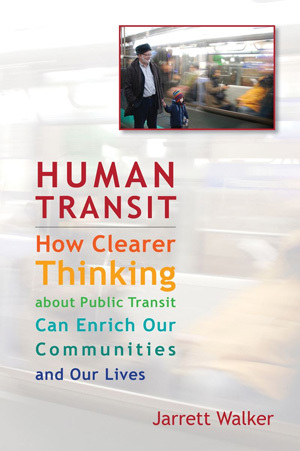 This blog and Human Transit book extolls the value of network design and the role buses play in it, including praise for San Francisco’s design. Lyft ignores this. I attended a California American Planning Association Conference session last year where an employee from Lyft gave a presentation. During the presentation, the presenter was marketing Lyft line. The presenter showed images of how Lyft line worked and proceeded to get extremely excited about how two people could be connected along the 24th Street corridor to connect to the 22nd Street Caltrain station in San Francisco. The example was supposed to display how Lyft complements transit. During Q&A, I pointed out that the route in the Lyft line example mirrored a Muni line (now the 48 line and proposed to be replaced by 58 line in future). Therefore, I asked, how does Lyft line not compete with transit? The presenter had no idea that there was a bus line there and asked me the line number. He then proceeded to respond that Lyft works better with rail than bus. 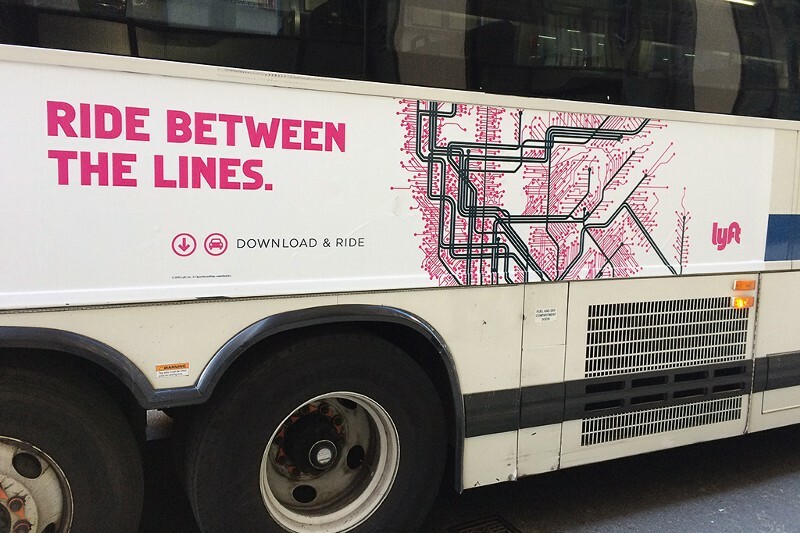 Both the ad and this response are technological (bus vs. rail) arguments, which this blog routinely criticizes. All taxi services increase congestion more than private cars because private cars are parked between uses whereas taxis are in travel lanes between uses. It matters not whether they are driven or driverless.Getting people out of their private cars and into taxi services (including app services) increases congestion more than riding/driving and parking. To the extent that disruptive capital dollars are used by unprofitable unsustainable ventures to lobby for increases in car travel space over all other uses (parking, biking, walking) and especially dedicated transit lanes, then you, Jarrett, are quite right to view them as antithetical to urban environments. And while they are no more likely to succeed than the previous century’s attempts they can set back this century’s limited but effective efforts at restoring quality city life. The taxis who troll for fares, this might be true. One which can park and wait for a smart-phone to call it? In those cases, your theory is NOT true. I suppose it depends upon how close is the parking. Would they consistently park closer than you would? I would say yes probably. Short-term parking would be easier to find than a spot your car for the whole day. Off-street car storage worsens cities more than cars on the road do. The less of your city that is parking, the more pleasant of a place it likely is to walk. Uber’s “policy” may be to replace single occupant vehicle trips. But their ad people aren’t being stupid or obstinate when they target transit passengers. Transit passengers are the low hanging fruit for Uber. They’re already used to traveling by means other than driving their own car. They may not even own a car. Taxis flourish best in strong transit environments, where people are making non-driving trips. Uber as a taxi replacement thus is most viable in urban environments. Uber’s actual, implemented policy is something like “We own the transportation world, you just live in it.” Uber has consistently fought even the mildest efforts at regulation, just like any 19th Century robber baron. It’s completely unsurprising that they would they would target transit passengers as a key market. The 19th century robber barons built America’s rail systems, you realize, right? Whether it was August Belmont (IRT), Francis Marion Smith(Key system), or James J. Hill (Great Northern), the only reason there is rail-based “public” transit in many of America’s cities is that it was, at a time, a profitable investment. Do you realize that Francis Marion Smith was competing with Southern Pacific in the East Bay? Southern Pacific had set up network of suburban rail lines that were considered local extensions of its own large rail network. The competition only ended with the completion of the Bay Bridge and SP threw in the towel in 1940. Then Key System fell on bad times and was sold to National City Lines in 1947 and then the rail lines were slowly turned into bus lines with the last converted in 1958. *Frequent* transit kills this ad. In the 1980s, London Transport decorated some of its buses with the slogan “We’d All Miss The Bus.” We’ve known that our cities need transit longer than Uber has found a way to profit on the back of inadequate transit service. I still think this ad looks more like a woman, alone who has missed the last train of the night (hence nobody else who barely-missed the train), not the last train for another 5-20 minutes. That’s a trip uber probably should serve, considering the costs of providing 24-hour underground rail service. When CitBike was in its infancy in NYC(not even on the ground), City financial analysts feared it would take fares away from the MTA. This would necessitate the City increasing its subsidy to offset the loss of revenues to the deficit-‘rich’ MTA. This would be most apparent in Manhattan where short-trips have their biggest payoff to the MTA. I’ve not yet seen an accounting of this loss, only how CitiBike trip numbers have grown. No one is asking how many trips are lost by the MTA. There was a time when a millionaire might sit next to a dishwasher on public transit. Todays elites just don’t see themselves as part of the democratic mass. Compare John Rockefeller and Elon Musk, and you’ll see what I mean. OK, so Uber and Lyft aren’t “ridesharing” – they are taxi services even if the taximeter is virtual and not ticking on the dashboard. They are mostly unregulated compared to their traditional brethren, but taxis just the same. Along the same lines, Citibike, et al, are not “bikesharing” and Zipcar et al are not “carsharing”. They are vehicle rental companies. If you and your friends split the cost of a bike and then each use it when needed, *that’s* bike sharing. Completely different model. Nothing wrong with any of these but, please, can we call them what they are instead of pretending someone is sharing something? I prefer to use the term “short term rental cars” or “floating rental cars,” or “subscription-based rental cars” instead of “sharing” in our Seattle Times coverage, or “short term rental” for Pronto bikes. Wonderful! We need to get that propagated out to others. Thanks! Only truths in this post! So, yes, the 3M $3 million challenge to break through a piece of bulletproof glass really did happen, but many of the facts surrounding the ad campaign have been altered over time as the story was circulated around the Internet. Im impressed, I need to say. Really rarely do I encounter a weblog that’s both educative and entertaining, and let me tell you, you might have hit the nail on the head. Your thought is outstanding; the issue is one thing that not sufficient people are speaking intelligently about. I am very completely satisfied that I stumbled across this in my seek for something referring to this. This does not happen only in this country. It’s happening all over the world. Social equality should be everywhere. Zero discernible diffference in s your custom theme or do you download it from somewhere? Really enjoyed! Mine is the same, shows already downloaded with a date of July 9th. However the trick you shared, Sam is not working for me to resolve it. Hi there. I found your web site by way of Google whilst looking for a similar topic, your website came up. It looks great. I’ve bookmarked it in my google bookmarks to visit then. I would like to show my thanks to you just for bailing me out of this dilemma. Correct right after researching by means of the world wide web and seeing strategies which are not helpful, I figured my entire life was gone. Existing minus the approaches to the issues you’ve fixed by means of your main guideline can be a crucial case, and ones that would have in a negative way damaged my entire career if I hadn’t discovered your site. Your primary ability and kindness in playing with all items was precious. I’m not positive what I would have done if I hadn’t come across such a answer like this. I’m able to at this moment appear forward to my future. Thanks for your time extremely a lot for this impressive and result oriented guide. I won’t be reluctant to refer the sites to any person who ought to receive direction on this problem. Uber [oder Über…menschen] is merely a gateway drug to my chaffeured Lexani-Maybach. I agree with your article, the traffic in the big cities is getting hard. For a lack of a good mass mobility plan, we are experiencing this chaos. Muito bom seu conteúdo, como nosso transito esta cada vez mais complicado, nas grandes cidades, esta quase impossível sobreviver ao causo. transporte publico então uma vergonha total. Excelente artigo, a uber tem crescido bastante no Brasil, um grande avanço na minha opinião . I work as uber in Brazil, I have nothing to complain about. Uber is a giant nowaday. uber is a reality, uber and evolution. Great article. Uber came to help with transportation. It’s fast, efficient. Uber is the best solution for a chaotic city like São Paulo. Uber is here to stay. We need fast and affordable locomotion. I use uber every day for my work because where I live there is no subway nearby and the buses take time to pass and when they pass they are crowded. I guess uber is the best thing ever. Uber saved us against the taxi mafia.